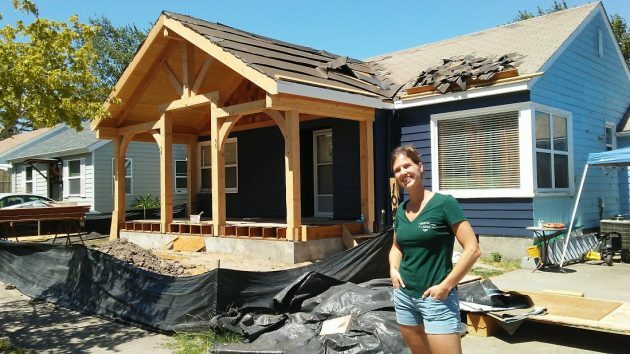 Jessica Morgan in front of her family’s house and its dramatic new porch on Monday. Moving along Albany streets on a bike this summer, you see lots of home improvement projects going on. Few are more eye-catching than the porch going up on this block of 14th Avenue S.W. The place is the home of Jessica and Shawn Morgan and their two sons. I was riding back from lunch Monday when the construction caught my eye. The house, Jessica told me when I stopped to take a photo, was built in 1942. She thinks it was one of the houses built at or near Camp Adair, the World War II training base in Benton County, and moved to Albany after the war. The Morgans have lived there since last fall. As I understood her, they had bought the place as a possible rental but then decided to move there, and they’re glad they did. They like the neighborhood, and the boys, 7 and 9, like their schools, Takena and Central. Jessica’s brother, Ben Bliesner, is building the porch for the family. With its solid beams and dramatic shape, it seems unusual on a house of that size (two bedrooms and one bath), but Jessica says that’s the kind or porch she wanted. Great job. Looks great. Great article subject. It’s a little depressing to read about some of the other things going on around town. Add the mess our country/world is in on top of local stuff, Geez. Ditto. Looking nice so far. Well this is certainly disheartening news; yet another historic house’s character defining features are destroyed on the owner’s whim. Other houses and apartments not part of this particular sub-division were built in SW Albany as well. This is very rare, as construction like this was almost unheard of during the war. You could just not use your gas and tire ration stamps to go to the local lumber yard and get a bunch of 2x4s to build a house. That was controlled for military use (for building barracks and other essential military needs). This makes the civil housing subdivision a very rare and unique part of Albany and Oregon’s history. 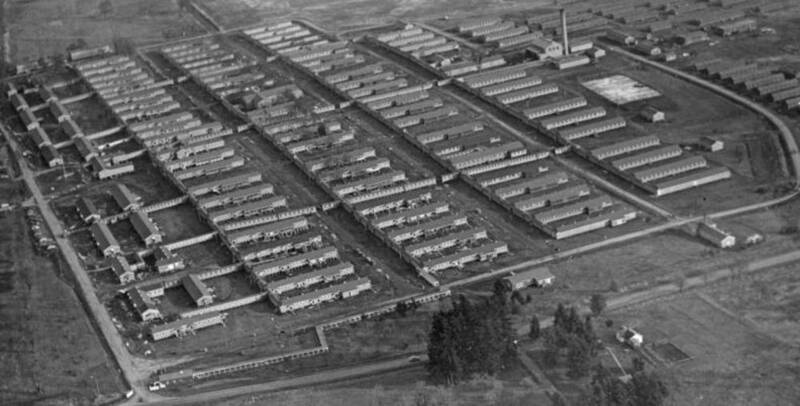 I do not know the full history, but given the date of 1942, the same year Camp Adair started, and the fact that the nearby United States Bureau of Mines did not locate to Albany until 1943, it is safe to assume that the cottages were tied to and construction justified by the severe housing shortage in Albany caused by the construction of nearby Camp Adair. The subdivision is unique not only because of its rare wartime construction timeline, but also because, to the best of my knowledge it is the first sub-division in Albany, something most Americans did not see until after the return of GIs following WWII. Again refer to the Bob Potts photos. The houses in the subdivision are all of similar size and construction. All are minimal traditional with simple hipped or gabled roofs, minimal eves, and corner windows (originally they were all horizontal 2 over 2 double hung). They did not have porches, but rather a stoop, either as an insert into the house, or as a front gable eve overhang. In short, very classic and typical minimal traditional houses built during the late 30s though early 50s. Concerning that added porch, “With its solid beams and dramatic shape, it seems unusual on a house of that size”, is a bit of an understatement. It is completely out of character with not only the house style, but the entire sub-division neighborhood. Minimal traditional houses did not have porches, they had stoops, and if they did have a porch it was very small (minimal in fact). If a person really wants a porch this large, I wish they would buy a historic house from a different period (1920s Craftsman/Bungalow or earlier) or build a new house in a different neighborhood, not continue the integrity decline of one of Albany’s most historically important but overlooked neighborhoods. Good for you Hasso. It’s nice that people can do to their home what they chose when they buy it. It doesn’t need to appeal to anyone else’s tastes except the person who invested in it. Good job home owners. “Tastes Change” is exactly the misguided attitude that allowed cheese graters to decimate downtown in the 60s, at a cost of millions to undo and restore. There will always be people that want houses with a history, a story, and character behind them. When that is removed, it robs both current and all future generations of their heritage. And you are completely out of touch with what young home buyers want today: small affordable, unpretentious, yet genuine and real: in short a minimal traditional house. The fact that the historic significance of this house is tied to the fact that it is part of Albany’s first subdivision, means the significance is tied to the fact that it mimics the rest of the houses of the subdivision. Adding a porch to this house adds interest in the same way that bashing your fenders in your car makes it more unique. It looks fantastic. It is nice to see people take pride in their homes and fix them up. Honestly, unless you are willing to pay for the “historical ” improvements you should stay out of it. Too many people take offense to people improving homes in the historical area. The porch looks exciting. My late husband built great porches, so right on! The idea is heart-touching.